As a reward to you for sharing these life changing products with others and helping me to impact and change more lives I am offering you this new program. You will earn 30% on every product purchased through your link. As an extra bonus you will have access to all products at 50% off, cheaper than they are ever available to anyone else. You can share your review of the products with the people you know to help them have the same results too. You can also share on social media, your website or anywhere else with people who have an interest in personal development. Get access to your custom links to share with friends, family, on social media, your blog, website etc. Get 30% income from each product sale through your links. It’s quick, simple and a great way to earn extra money. 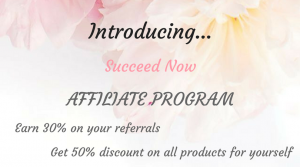 Click here to join the affiliate program for free – start earning 30% income on all products purchased through your links.